But most of all, science has found many health benefits of keeping a fish tank, which came as a total surprise to me. So if you’re thinking of buying that fish tank, you might have more reasons to do so. Or if you’re thinking of discarding that fish tank, you might want to change your mind. You may even begin to look at fish tanks with an entirely new perspective. Towards the end, I’ll reveal a “lazy man’s fish bowl” which I recently fell in love with. To begin, let me start with some scientific findings on the benefits of keeping a fish tank. 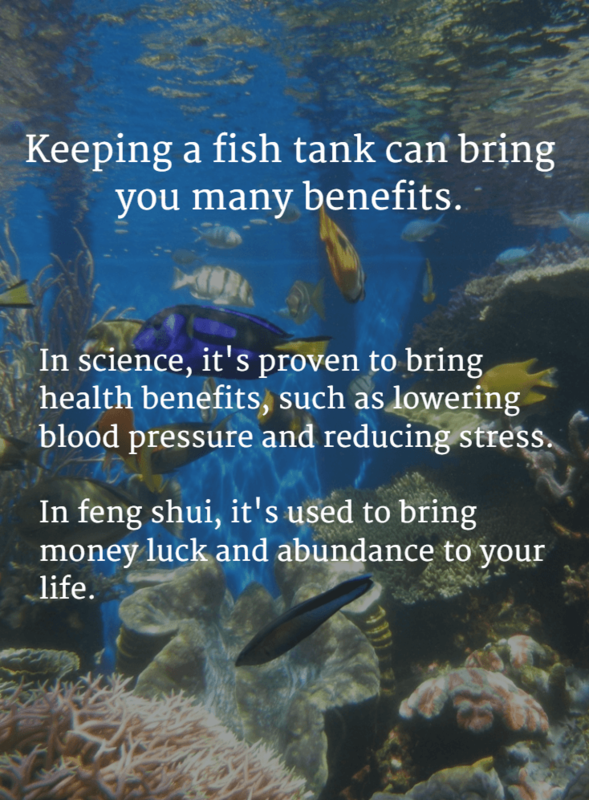 I found four health benefits of keeping a fish tank that are backed by scientific research. I tried rationalizing them, and here’s what I came up with. We humans have a natural attraction to water. We cannot survive without it, and we cannot grow plants or domesticate animals to feed ourselves if water is completely absent from us. So perhaps its beneficial effects on us have to do with our survival instincts, or perhaps its embedded deep in our mind with our DNA composition. According to Allan Schwartz, LCSW, Ph.D, aquariums have the ability to reduce stress and anxiety by bringing the calming effects of nature right into the home. Having an aquarium is helpful in high-stress environments. This soothing effect is especially helpful in high-stress environments. 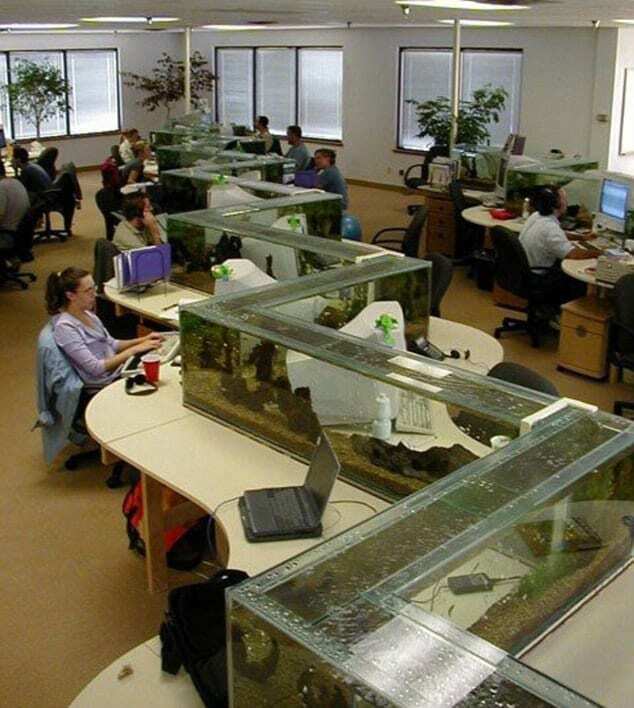 It is even suggested that work environments and executive offices install aquariums because of its stress-reduction effects. A few months ago, I was visiting a dentist and was about to get three of my teeth drilled. Even the thought of it now makes me miserable. Looking back, it could’ve been worse. There was a fish tank in the waiting area, and I couldn’t help but stare at a pack of gold fish swimming aimlessly around that tank. Thinking back, I was completely mesmerized by them. 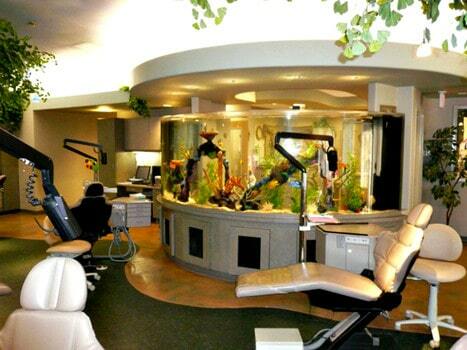 A fish tank in a dental office can calm you and improve your overall experience with the dentist. According to marine biologist Deborah Cracknell, “fish tanks… are often associated with attempts at calming patients in doctors’ surgeries and dental waiting rooms.” They also found that patients require less pain medication after having watched those fish in the office. The full science report is called Marine Biota and Psychological Well-Being. So even though I was hearing all those shrieking sound of teeth drilling or deep cleaning in the background (thinking of it still gives me the chills), I was completely taken away to another world when I was staring at those fishes. A study by Purdue University found that displaying tanks of brightly colored fish may curtail disruptive behaviors and improve eating habits of those with Alzheimer’s disease. The study found that patients exhibited more relaxing behavior and exhibited less physical aggressiveness, wandering, pacing, and yelling. They also found that patients ate up to 21% more food than they did before, with an average increase of 17% across all patients studied. Science have found that fish tanks can help pacify Alzheimer’s. Source: Purdue University. Further, they found that patients displayed better short-term memory, and they required fewer supplements and medications. So if any of your family members are suffering from Alzheimer’s (hopefully not), a fish tank may work wonders for them. Sometimes, the positive effects are better than drugs and medication. It’s amazing what scientific studies have uncovered about the health benefits of keeping a fish tank around. The soothing effects that they bring are natural remedies to some of the mental and physical problems we have, and are definitely something I prefer over any type of drugs. Besides mental and physical benefits, fish tanks also bring about other benefits, according to feng shui. Keeping a fish tank or aquarium is very popular in feng shui practices. However, there are many considerations when keeping a fish tank, which you are about to find out. To begin, let’s explore the feng shui benefits that a fish tank can potentially bring you. 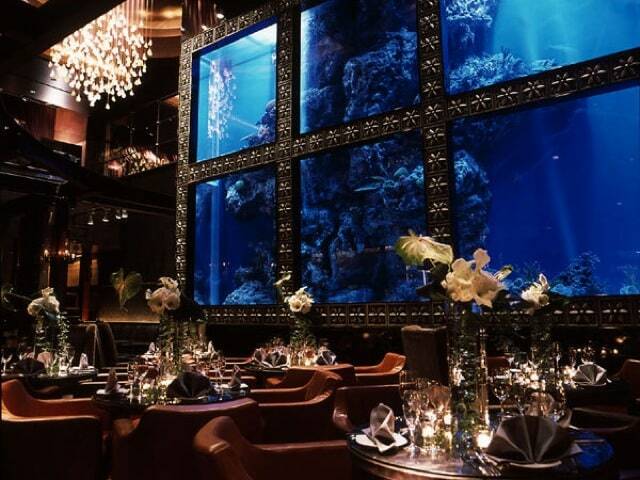 Luxis – an aqua bar and restaurant in Japan. If not used properly, however, fish tanks can cause a great deal of misfortune. To help you avoid them, here are some popular tips I found about how to use fish tanks to improve the feng shui of your home. But let me remind you that these tips are very general, and some may even seem contradicting because its application and practice is very fluid. Using the concept of the Four Celestial Animals, fish tanks should be placed at the front of the house for enhanced money luck. The front of the house is symbolized as the Red Phoenix. If the front of the house is a door, you can place the fish tank towards the frontal left (assuming you’re standing in the middle of the house). The left side is symbolized as the Green Dragon, and it is said that this placement also brings luck because dragons favor water. Using the feng shui Bagua, southeast is the best location to place the fish tank, because it is the area for wealth and abundance. Next is north, which is career, followed by east, which is health and family. As for stars, some experts say that it is suitable to place fish tanks where the Star #8 reside. The stars rotate every year, and in 2016, Star #8 will be residing in the southwest area. As for constellations, it is said fish tanks are suitable in east and southwest area. These constellations rotate every twenty years. For 2004 to 2023, east and southwest are suitable locations for fish tanks that can help enhance money luck. Finally, you can put an aquarium in the wealth area of your home. However, finding the wealth area may require some expert consulting because its location is usually different in each house. 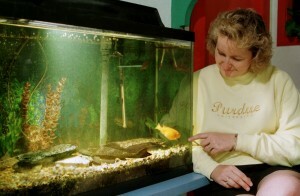 If there are suitable places to put the aquarium, then there are also places that are NOT suitable. In fact, many feng shui experts agree that having a fish tank in the wrong place can cause problems and misfortunes. First, it is said that fish tanks are not suitable at the center of the house, because this can cause sickness to the spouse and financial problems for the breadwinner. According to the constellations, northeast is not suitable for fish tanks in the period of 2004 to 2023. This can cause poor health, monetary loss, and setbacks in career. Other places to avoid include the bedroom and the kitchen. Feng shui advises against a fish tank in the bedroom or kitchen. The bedroom favors a static environment, which is one reason why the constant movements brought by fishes are not suitable. Further, the light and distractions brought by the fish tank are also feng shui distractions that can affect your sleep. The kitchen is where the fire element is strong. Because water clashes with fire, your kitchen may feel a little “weird” when you place an aquarium in your kitchen. Some even say that this clash can cause health issues to people in the house. From personal experience, the grease smoke from all the cooking can easily pollute the water (especially if there is no lid), which makes your aquarium much more difficult to clean. Does the Number of Fishes Matter? It is commonly said that the fish tank should contain 9 goldfishes, where eight of them can be red or gold and one of them black. Most popular tip is having 9 fishes with one of them black. Some say the purpose of the black fish is to absorb the negative energy. When they die, some believe that they have absorbed more negative energy than they can handle and have spared you bad luck. Conversely, there others who say that when goldfishes die, you have NOT been spared bad luck. The goldfish are just being hit by the same type of bad feng shui energy as those in the same house, and essentially nothing has been “dissolved”. The bad feng shui energy that killed the goldfish is still around, hurting both you and the goldfish. 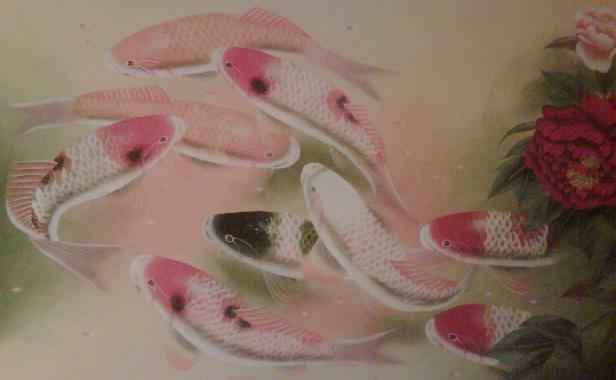 Using the Lo Shu Square, 1, 4, 6, 8, and 9 are good number of fishes to have in your fish tank. To reiterate, avoid having 2, 3, 5, and 7 fishes. Number of fishes to depend on your Kua number and varies by individual. Using the five elements, where 2 and 5 are earth elements that restrains water which is unfavorable for good luck. Using symbolism, eight represents prosperity and nine represents culmination and completion. Also, my trusted Feng Shui Master – Uncle Dixer – mentioned that the auspicious number of fish is based on you, your family members, your gender, and the size of the fish tank. For instance, if you’re in a household with one husband, one wife, and one son, an auspicious number would be one black and six goldfish. As you can see, the number of fishes from different sources can get quite confusing. I personally don’t think the number of fishes is that important, as long as there’s a suitable number for the size of the aquarium. Some experts suggest that the placement of the aquarium should not conflict with the five elements of a given area. Even though an aquarium contains a little bit of all five elements, it is predominantly water. Using the bagua, the only place that is not suitable is the south area of your home, which has the element of fire. Also, placing a fish tank is not as simple as just placing it on the southeast or the front of the house. Other considerations, such as the amount of sunlight, can affect the water temperature and the growth of algae that diminishes the overall appeal of your aquarium. Algae is a big issue on the overall appeal of your fish tank. And if you have a salt water aquarium, simply keeping the coral reefs alive can be quite a difficult task. Keeping the water clean is very important as well. Not only does polluted water (from all the feces produced by the fishes) bring horrible feng shui, it has a direct impact on the health of the aquatic creatures living in your tank. Further, the sight of murky water can bring added mental stress just as how clutter can clog your mind. Some feng shui experts also put the shape of the aquarium into consideration. Using the five elements, circular is metal, rectangular is wood, and irregular shapes are water, and all of them are suitable shapes for your aquarium. Rectangular aquariums are quite common and is a suitable shape for your aquarium. However, triangular is fire and square is earth, and both are not suitable shapes for your aquarium. If you’ve never kept aquarium before, I’d suggest that you stay away unless you have genuine interest (and not just interested in having more money luck). 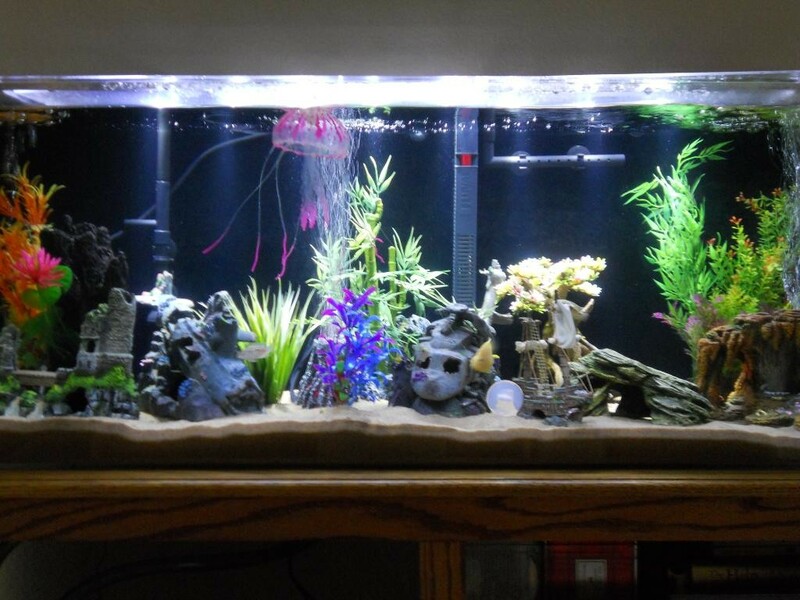 First, the cost of keeping an aquarium can be quite pricey. A good looking one (or something that you envision having) can cost at least $100 dollars and up. Further, you need the equipment and machineries to keep the water clean and the temperature suitable for the types of fishes (salt water or fresh water) that you want. I personally think it is much more work than having a dog. So that’s why I’ve recently fallen in love with what I call the “Lazy Man’s Fish Bowl.” It’s real name is actually the EcoSphere Closed Aquatic Ecosystem, where live fish and reef is inside a closed container and in a self-sustainable ecosystem where no maintenance is needed! 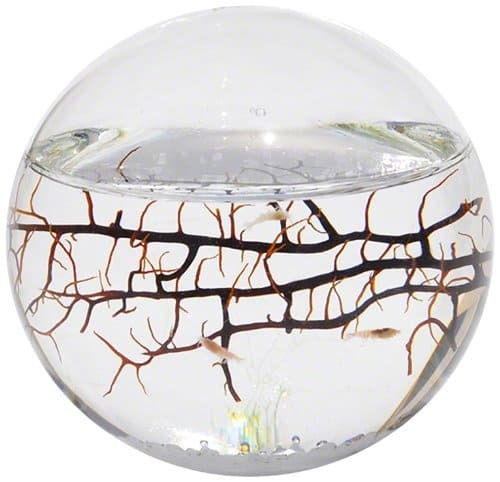 An EcoSphere Closed Aquatic Ecosystem that’s completely self-sustainable, Small Sphere. From what I can find, it’s size and shape comes in small pod, small sphere, large sphere, and extra large sphere. 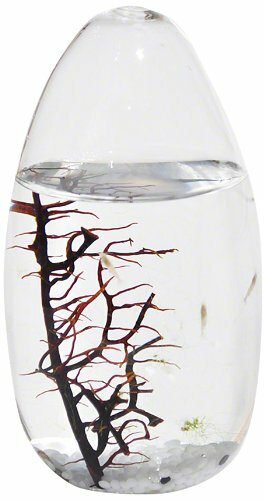 Ecosphere Closed Aquatic Ecosystem, Small Pod. If you do decide to buy one, please note that the living creatures and plants need proper temperature and natural lighting. So please follow the instructions so you can keep them alive as long as possible! If you’re looking for a stress-reliever in your work environment, keeping a fish tank can definitely help, as science have suggested. And if you feel that it’s too much work, you can definitely try out the Ecosphere as mentioned above. On the other hand, if you are dying to enhance your money luck, and think that all the hassles of keeping an aquarium are bearable, then I suggest you start working harder and smarter first. If that doesn’t work out, and you feel you need all the help you can get, you can then hire a feng shui consultant to help you. The expert that you hire can help you make sense of all the consideration and conflicting information that you saw earlier. Perhaps the expert may even suggest an alternative way to enhance your money luck without needing a fish tank! What was your feng shui experience with aquariums and fish tanks? I’d love to hear about them in the comment section below! Hi, I have 8 gold fishes 1 black shark ,1 oscar and 1 aquarium cleaner black one. And Since the day we have settled the aquarium already 7 gold fishes and 1 oscar had died(We hve already replaced the gold fishes). We have placed it exactly opposite to the entrance door, so the aquarium is in the north of the house. Please let me know if this combination of number , types and placement is correct. I am from New Delhi, India. As for number of fishes, I think you shouldn’t worry too much about it. Just make sure that the number of fishes is not too much or too little for the size of your aquarium. I have 8 gold fish & 1 shark (black) Tank size H 11″,L-1.5 feet,D-9″ kept in north of living Room,but gold fish are frequently dieing. shall keep 1 Arvana fish instead of this for better luck. Hey Bhat. Did you mean arowana fish? If so, it is auspicious mostly seen in business settings instead of the home. From what I know, that fish is quite expensive and illegal in some countries. Before putting in big bucks into it, I’d suggest you try to place the aquarium somewhere else if possible! Yes, fishes with different variety is OK, as long as they don’t fight each other! I think it’s OK to have 5 koi and 3 goldfish. I agree with what Laurent said in this post: “For the species and number of fish, they all depend of the cultural preferences of the clients.” Don’t get too hung up about the number of fishes! Yes, living room is a great place for fish tank. And according to an expert, east and southwest are suitable locations for fish tanks that can help enhance money luck from 2004 to 2023. Hi Michael, northwest belongs to gold, and water exhausts gold. A small aquarium in the area should do just fine. Living room area in front of door is good too! Hi Michael. Yes, this is a quite a common practice. Just remember to keep the pond clean. Murky/dirty water is a feng shui killer! can we put 8 gold fish and 1 black shark as per vastu ? Yes Nirmal, of course you can! For number of fishes, its ok as it’s more for personal preferences. The North area belongs to water, which is good. Close to the dining area is also ok. The type of fish is really personal preference. The important thing is that the water is moving rather than stagnant, where fish can help achieve. So yes is the answer to your question. hello sir,i have 8 gold fish and 1 black gold fish as feng shui can i keep one crocodile fish with them. The types of fish to keep is mostly person preference. 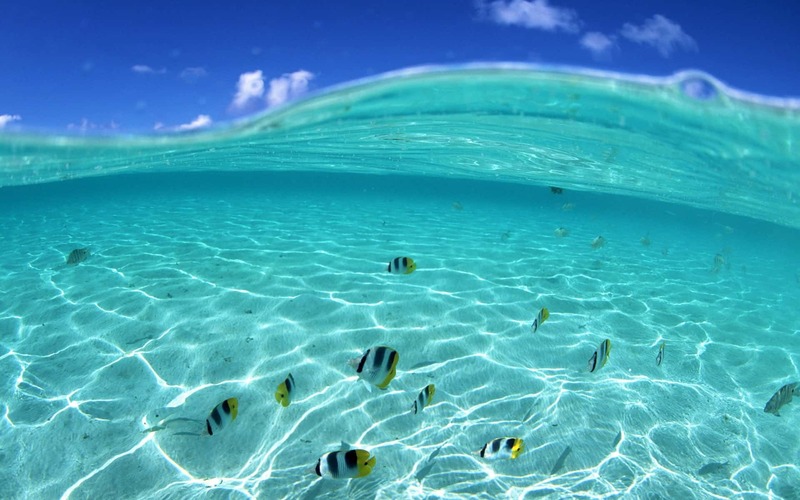 The important thing is that the water is moving, which the fishes will help you achieve. Yes, you can add the 10th fish for cleaning. In fact, a clean fish tank is very important. i have a rectangular tank with one water filter and one small round stone filter, one heater and a fish tank tubelight. In the tank i have 8 gold fishes, 1 black moore, 2 calico goldfishes, 2 japnese koi fishes and 2 sucker fishes, total of 15 fishes with coloured stones. 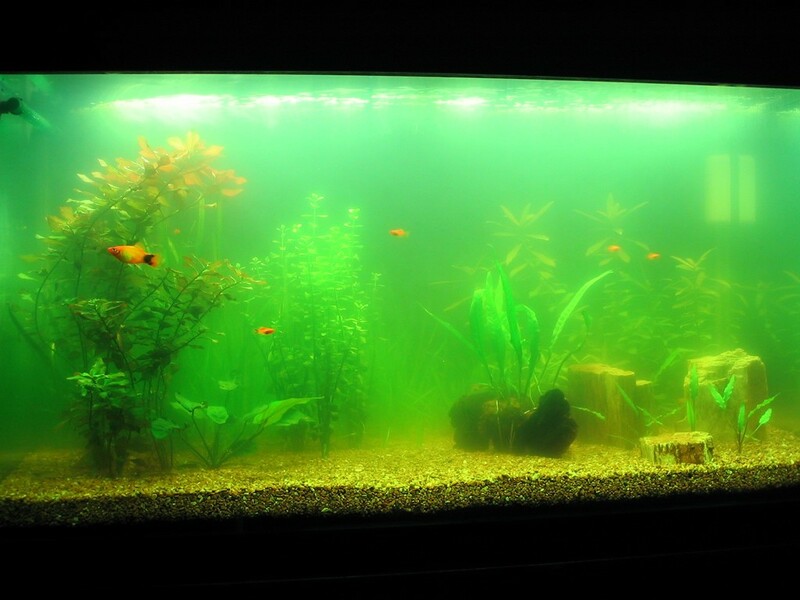 The tank which is two and a half feet tank holds upto 40 litres of water. It is a good number (15) as per fengshui or not. Please advise. I have another square fish tank with coloured tank and a water filter. In this one i have 10 guppy fishes (2 pregnant females one normal female fish, rest 7 are male guppies i guess. And one sucker fish. Total of 11 fishes. It is a good number (11) as per fengshui or not. Please advise. The number of fishes is more of a personal preference than actual Feng Shui. The important thing is that the water is moving (and not dead), which the fish help accomplish. So yes, the number of fishes is good considering the size of your fish tanks. As for light, it depends on whether you need more Yang energy in that place. Thanks Victor. This was helpful. And was the quickest reply i vould get from anyone else. Thanks once again. Hi myself kalpana,m just planning to keep 5fish in the aquarium it will will having any problem because i dont have more space to keep a big aquarium so wat would you suggest me. Hi Kalpana, 5 fishes are fine if you don’t have a large aquarium. Just remember to keep it clean! I have 2 small fish tank.I have put one blue-black fighter(betta fish) in one tank because generally kept single.and in other fish bowl there are 8 fishes. (2 silver sherk,2 milky fish,4 orange gold fish).two tanks are placed in dining room towards north west.and I have set a pink dim light on the top of the fish tank.Is it correct ? You please guide me. Dining room is a great place to keep your fish, and the number of fishes are good too. As for direction, the overall floor plan should be considered instead of just the direction within the dining room. i have bought small fish tank so cant put 9 fishes ,is it fine to put 2 or 3 fishes? 2 or 3 fishes are completely fine. Just don’t over-stuff your fish tank! hi i have kept fish tank mu entrance its facing towards east is it ok and is it any count is there for fish to keep i have almost 18 to 20 fishes in small taknk. all are good and alive i dont have any issue. please suggest me i have to change my tank or upgrade. Entrance is a great place to place your fish tank. Just make sure that your fish tank is not overcrowded. Hi, I am really planning to put jy aquarium in my bedroom. What can i do to negate “bad” feng shui having it inbthe bedroom? Not sure what “jy” aquarium is. But water in the bedroom is not recommended. Some experts say it affects not only love, but also health and wealth as well. To negate it is just to remove the water feature (aquarium included). If you’re adamant on having it, then I can only suggest you to turn off the motor/lights of the aquarium when you go to sleep. Hiya Am very much interested in feng shui related stuffs and i am planning to buy a flowerhorn fish in an 2″1/2 feet tank Will tat brings wealth nd happiness as per feng shui ??? 2.If i go with flowerhorn do i need to stick on particular colours or stripes in it ??? Please guide me Victor . Both types of fish should work for you. Arowana fish are commonly used for wealth and is seen more in business settings. As for color, it depends on personal preference. For Feng Shui, water feature is great! The purpose of the fish is so that the water is “alive” and moving as opposed to “dead” water. Thank you very much for the reply Victor. My house entrance is north facing and i have read the article it says the aquariuk set up should be in south east here the south east side is our bedroom . So can we keep the aquarium setup in south west corner in our living room facing the main entrance (North facing)?? Fish tank is great for entrance area, dining, and living room, in general. However, I wouldn’t suggest placing it in the Southwest corner (read this post: https://fengshuinexus.com/blog/feng-shui-rules-related-to-supernatural/). If you want to place it in the Southwest area, at least don’t put it in the Southwest corner. 2. Wealth and prosperity area differs by house and by person. It is ok to place the statue in the living room. Don’t give offerings unless you know what you’re doing. 3. Buddha statues won’t attract wealth in terms of Feng Shui. The most important thing is movement, which is done by water features (fish, flowing water). You’ll see it in the upcoming post by Laurent Langlais. Shaun, if you truly want Feng Shui to help, find a trusted expert to get the right setup and have all your questions answered. It is really interesting that having a fish tank can have the same effect on your stress as the sound of running water. I will have to look into a small fish tank for my small apartment. I can imagine falling asleep to the sound of the water flowing through the filter. Yep! The sound is very soothing! what would happens if i have loft house and the place (nw) that i put the aquarium is a bedroom on the second floor? I’m staying in a bungalow facing south east. I plan to build a koi pond outdoor. My pond is 5 feet in diameter and 2 feet depth with a 3 Tier fountain at its centre. Which location outside my house is the best for my pond? Generally, East side is the suitable place for a water feature because it’s the side of the Dragon. However, not all outdoor gardens are suitable for water feature. I’d suggest that you find an expert before you commit into building the pond. Thanks for your reply. Ihave kept south west laughing budha statue is it ok and i can keep any fengushu things. For money flow can i keep in any material in pursue. plese suggest me. The laughing Buddha is a great decor. It won’t help much with wealth in terms of Feng Shui. The important thing is movement, which is achieved by water features (fish, flowing water) or by plants (growth). hi, Good day, i was confused by a comment coming from my fortune teller, she said that it is not good to put a aqurium(arowana) in the office. Now i have one a 100Gallons with RTG arowana. She said its only good in restaurant where the customer is need to keep them in coming in. Can give your best opinion, and OK to you i will keep it and where is the best location? Thank you. Your question beats me. Arowana is something more unique than just regular fish. But in terms of Feng Shui, the key is to have movement in a certain area. This is usually done by water feaures or by fishes in a fish tank. Sir my gold fish die one after other. The aquarium is contains filter and heater on auto mode. I use to feed fishes twice daily sometimes with homemade food and else with paked fish feed. The direction of aquarium is north and is kept in lobby adjacent to kitchen entry. It hurts when my fish die. Please suggest me something sir. From what I know, goldfish also prefer seasonal changes. So temperature should adjust according to seasons. Also check if the kitchen fire or cooking fume is harming the goldfish. Make sure they’re getting clean water and sunlight as well. Thank you for sharing sir. I change half water of tank after every 3days otherwise it also have water filter too. I’ll look into it. Thank you so much sir. Can I use any type of fish for feng shui or do I have to use gold fish? You do not have to use gold fish. I suggest that you keep the kinds fish that you like. In terms of Feng Shui wealth, for example, the important thing is that the water is “moving”. Having fish will help keep the water in the flow. The other popular option is to have a water feature, which also keeps the water moving. Hi! My name is Badette. We live in an apartment and i wanted to get an aquarium I am not just sure where to put it. When you say north, is it facing the front door or true north. Am planning to put by the entrance area where it is the first thing you see when you open the door. Is that ok? Entrance area is a good place for the aquarium! When referring to North, it means the northern section of the house according to the compass. North is suitable for aquarium only if the energy in that section/area is weak. Otherwise, too much water will create an imbalance in that area. Thank you so much. I have another question, I have galloping horses cross stitch is it ok to hang it above the aquarium and I have 5 fishes and i think i read it somewhere that its not good? You have nothing to worry about hanging the galloping horses on top of the aquarium. I have place my fish tank at southeast corner of my living room. I have kept only one flowerhorn fish in it. I wanted to ask can i keep decorative material like house inside the aquarium is it good or will have negative impact.. The type of fish don’t matter as much as where you place the aquarium. It’s the water and the movement brought by the fish that should activate the energy of an area to bring wealth. As for type of fish, it’s important to put the type of fish that you like. That way, you’ll feel great whenever you look at it. Thank you for your post. I’ve been keeping fish for 40 years and love it’s calming affects. We’re moving into a new house. The front door is located on the south side of the house. Our master bedroom is in the SW corner of the house (wealth sector), but the sector actually extends into the living room, which includes the front door. I’m using the Chinese Bagua, not the westernized version. I want to capitalize on placement near the wealth sector, but do not want it to bring bad energy to the marriage. I trying to punch up the romance in that room without monkey business. Should I place the tank in Fame sector of my living room? Or, should I forget about the south side of the house altogether and place it at the center of the north wall, which is located in the dining/family room area? It really depends on what you’re trying to achieve and your priorities! Personally, at my age, I would place it on my wealth or fame sector. Another key consideration is the type of room. I personally like it in the living room because of its soothing effects. So really, throwing it back at you, it really depends on you personally. It’s good that you have so many choices! can I have more than one fish tank? say one in my lounge and the other in my home office? Of course you can. Those two places are great for a fish tank! I had kept 9 red gold fish and 3 black shark in my tank. my aquarium tank was broken. I was Soo confused, what to do these fishes. I taken them into a river and I put all fishes in the river…I was disturbed after that.. I want to know, is this brings any bad luck to me? What do you mean “disturbed”? I like to make a new aquarium. Can you suggest some fishes and their number for me? For fish, I suggest those that you like so they’re always pleasing to your eye. I have recently purchased a 10″ fish pot. I have kept 4 fishes + 1 Suckerfish in the tank, which swim around spaciously. Is there any issue with keeping 5 fishes, as I’ve read somewhere that 5 fishes are not good as per feng shut. how can i know were the northeast of the house is to put a fishtank? First, locate where the center of the house is. Then, standing there, use a compass to locate where the Northeast is. Finding the center is easy if your house’s floor plan is squarish. If not, some work needs to be done. If that’s your case, I suggest you find an expert to help you. Yes, that place is ok. You just need to consider other factors mentioned in this article. I recently set up an aquarium with arowana and placed it across the gate adjacent to the door of the living room. by compass it is in west. do I need to re-arrange it? There’s no need to re-arrange because it’s a good place to have your aquarium. Arowana is said to be great for business! By the way I started a small print/layout services business in our own home. Sir , I want a aquarium in my kitchen which is in the south east direction of my home .Plz give me some remedies so that I can place a n aquarium in the kitchen. Aquarium in the kitchen is not recommended because of the conflict between water and fire element. Hello Victor.. how are you. I have 8 gold fishes, 1 black more and 2 suckers so a total of 11… are they good as per your knowledge. What if I keep more different varities of fishes apart from these 11 fishes… is it OK. I have a 200 liters fish tank. Are odd numbers good or even numbers?? ican i put my aquarium in my lobby south west or west south direction. it is also front of my lobby entrance gate. Yes, the lobby entrance gate is a great place to put your aquarium. If you haven’t noticed, many people use this placement, especially businesses. In 2017 where do I suppose to locate my aquarium and as I’m keep reading 8 gold fish and 1 black ..can we add diff varieties of fish after those 9 as well or not .. I had placed the fish tank in the center of the house… We had experienced what you mentioned and also our dishes kept on dying. I am planning to change the position of the fishtank. I prefer to keep fish tank in the living room itself. The most feasible location will be either East corner or North East corner. I couldn’t come to a conclusion from the article. Can you please guide me through the advantages of placing the fish tank in each position (other directions as well)??? Living room is a great place for your fish tank. I would also suggest East section of the house (assuming East is your living room), because it correlates with Wood, and water produces Wood. I have a house which is NE facing, more towards E.House is in slight uphill position.To enter the house we have two fleets of steps separated by a landing space.I have kept a plastic brown barrel pot container( not see through glass,completely opaque) with water plants and two fishes serving as an aquarium with river rocks on the bottom.When I open the front door, which is NE facing,I can see the steps going down,then the landing with this aquarium.My question is, should I take this container up the stairs,right outside my front door,where there will be more shade since I have a covered patio outside the front door or should I keep it where it is right now.I live in hot Texas.Also,should I add more fishes to the aquarium?I have just two in it.Should we consider the direction of the container if it is kept on the landing,which is also NE,since it is outside the house structure/ building? Pls suggest. Feng Shui wise, it is quite common to see a fountain/water feature right outside the front door, assuming there’s a front garden. For me, I would place it closer to the front door, which is your shaded area. Thanks a lot Victor for the quick response.So, direction wise,the position of container is fine? (NE)Also,is it OK that it is plastic and opaque?can i add pebbles to it ? Yes,, pebbles are great. As for direction, water features are usually not suitable for “gardens” at north or south. Whether it’s plastic or not depends on your taste. Sorry to bother you again.I am not keeping the container pond in a garden.I kept it right outside my front door.It is kept independently on my patio.Do you suggest to move it to any other direction?Thanks again ! Apologies for the confusion. Keeping the container pond outside your front door is good. I have a 30 gallon Aquarium in which I have all different kinds of fishes which includes Parrot Cichlids, Silver Sharks & Angels. I do not have any Gold fish or Koi karps. Does this effect the Feng Shui positive effects of not having a gold fish. My aquarium is placed in the East direction of my office building which is right next to the main door entry. Is the placement good? I have a total number of 9 different fishes. Any suggestions?? I saw that you asked Uncle Dixer the same question and he gave you a detailed response. Check your mail for his answer! There’s no problem keeping 2 fish tanks, just as long as you follow what this article tells you. Northeast is Gen, the Earth element, which actually fights/clashes/conflicts with water. So ideally, don’t place your aquarium in Northeast. Perhaps other areas such as the dining area or study room? Oh, and thanks for responding to Pooja! Your is not in healthy condition.please buy koi breed if u can’t take care gold fish properly. Not sure what a hostel room is. If you sleep in there, ideally, do not place it there. But a small fish bowl shouldn’t do much harm. I am constructing a new house. My lot faces west, so i am placing my front door facing northwest instead of entirely west. Before reaching the front door i am placing a koi pond with a fountain. Upon entering the front door, i intend to put on the righthand side my living room and my very large saltwater tank. My tank will contain saltwater sharks, among other fishes. Across this area is my dining room and kitchen area. Please note that my tank is actually on the west side facing my kitchen. 1. Is my tank placement okay? Or would it be better off someplace else? Would it be better to exchange it with my kitchen area so that the tank would sit in the east side and my kitchen on the west? 2. Any fengshui tips about saltwater sharks– are they bad fengshui for a home? My tank is way too big for just goldfishes. It would fit probably 200 goldfishes actually. 3. Is it bad fengshui if the tank faces directly the kitchen? I am hoping it is not since the tank is not inside the kitchen anyway. 4. I have a pond outside my front door, a very large saltwater tank inside the house frontng my living room, and a swimming pool outisde the backyard. Is this too much water feature already? My animal sign is a water rat which probably explains my penchant and addiction to aquarium pets. 5. This one is just out of curiousity– a friend once told me not to place an aquarium facing a window as this would encourage infidelity in my marriage. I do have a family with 3 kids. Does this fengshui tip have any basis, or at least is my friend’s advise correct? I hope you can respond quickly. 1. Placing it in the living room is good. 2. Feng Shui is about water and movement. Sharks and other living things create the movement. Nothing much to worry about here. 3. Facing kitchen is fine as long as it’s not in the kitchen (or close proximity to it). 5. I haven’t heard of this one. Don’t think you need to worry too much about this. After reading some of your posts here, I followed your advise on getting my kua number. I got it through the kua calculator, and my number is 1. Also. I reviewed the placement of my lot, and I was WRONG. My lot actually faces North and not west. So, since my kua number says my unlucky areas are northeast, northwest, west and southwest, I may have to rethink and redesign my house. However, I am left with 4 areas that are said to be unlucky, and I don’t know what to do with them. My main door would also need to be transferred, but I don’t know which would be the best place since the prospect areas for my door are already considered bad areas. Imagine this: my lot is rectangular. The longside at the front is facing north (which at first, I thought was west). My original door was a cut across that corner, left side, which makes it northeast. This is a bad area for me. If I put it on the other side, it is west and northwest, both bad areas too. The back side is south, but that area is already the backside and borders my neighbor so I cannot put a door there. The only areas left for me are east and center north. But my east side may be a bit crowded since my garage will probably take more than half of that side (southeast, but already outside the house). Can you make suggestions on how to deal with this and brighten my day? Another thing that sort-of boggles me– in placing my areas which reference should i use: the house or the lot? Because I can put my aquarium (and bedroom on the second floor) on the SE area OF THE HOUSE (considering my door faces east), but if I take a look at the LOT it is not SE but somewhere in the middle (like South or maybe even nearing towards SW). The house is placed in the middle of the lot, with extra space on the sides. So if I take the LOT as reference, then my garage will be on the SE area and my house would be in the middle, which is in the direct south area. Would it help if I send you a sketch of my house plans? Where do I send them? Your reference should use the house, typically the 4 walls that surrounds your living space. That’s also assuming everything is connected within. Meaning, if your garage leads to the outside space instead of inside your house, it should be considered as a separate unit, even if it shares a wall with your home. Hey Vic, you don’t accept paypal? I was gonna buy your ebook but I didnt see any paypal method there. Thanks again Vic, you’ve been very helpful. So, using your advise as my guide, I will treat my house as a separate unit from my garage, my lawn and my pool area (outside the house). Since my lot will be divided into 4 areas (the garage, the house, the pool and the lawn) each area will have its own set of lucky and unlucky directions, right? Or am I wrong? I hope you can imagine this: my lot is rectangular. the first part or area is at the leftmost, that will be my garage. Next to that will be my house. Next to the house is my pool area, and lastly next to that is my lawn (rightmost part of the lot). The entrance of the house would be facing East, adjacent to the garage. I guess no extra fengshui would be needed for the garage? My car would be facing N direction as does our main gate. I might consider putting a generator set at the SE side of that area, is this ok? As for the house, the main door faces E (as per my kua number). Just outside my main door is a koi pond (E direction). Maybe I will put a little bridge over the pond to get to my main door. Upon entering the main door, my aquarium would be on the left side (SE), and stairs on the right side (NE) leading to the second floor (where bedrooms will be located). Still on the groundfloor, my living room would sit on the S direction of the house (next to the aquarium), and a guest toilet at the SW corner. My dining area would be at the N side (just after the stairs), and the kitchen after that at the NW corner). For the bedrooms at the second floor, master bedroom would be at the SE side. Headboard would be pointing E.
Can I put a Christian altar facing E right outside the bedrooms (sort of a hallway)? The swimming pool would be right in the middle of its own area (but actually sits just outside the house’s west area (unlucky for me). Is this bad? I apologize if my queries are taking too much of your time. I do need help in my house plans. I want to get it right. Thank you for your valuable advice and patience. P.S. Please do let me know when you can start accepting paypal payments so I can buy your ebook. If you’d really like to get it right, you need an expert consultant to be ON SITE. That way, they can do accurate measurements and identify anything that you’re not seeing. Any tips you receive from me through messaging barely touches the tip of your requirements. You should check their certifications and which schools of Feng Shui they practice. Also, I’ve found that consultants who take your Bazi into account produces better results. My bagua number is 3(Jan-11-1989). I am currently arranging my new office studio and found out that my bad directions are North West, West, South West and North East., moreover my main door is at the north west. Any tips and suggestion? hi, is it good as per feng shui to have a betta fish alone in a bowl in the North east of my hall opposite to the main enterance door?? Northeast is Earth, and Earth controls water. There’s not too much water in your fish bowl, so I think it’s a nice addition. Based on the five elements, I would suggest that you place it in the SE corner because that area belongs to Wood, and water helps produce wood. Personally, I wouldn’t mind if not many people see the fish tank, because chances are you don’t have guests everyday. It should mostly be for yourself and your family. That’ll depend on your personal preference! Not sure if you are still answering questions, but I’ll give it a try. My house entrance is facing south and once you walk in through the door, I have my fish tank to the left, which is considered the south east area of my house. Is this okay for good overall feng shui? Southeast is associate with Wood, and water has the ability to enhance Wood. So I would say, yes, it’s a good place. My question is, if we can keep 2(1 small & 2 Big) aquariums at home so that is it good for us and our home or not ? I can’t comment on this without knowing the details of your home. But since aquariums have positive effects on us, it should benefit you and your home’s occupants. Southeast is correlated with the Wood phase, and water nourishes wood. Yes, this placement is fine. Yes, of course you can decorate your aquarium with plants. In fact, I believe experts suggest it. Decorations totally depend on the types of fish you get. You’ll need to find some articles or talk to some marine biologists to know which plants are better for your fishes. Good day! It is ok to take care an arowana or gold fish when the profession of my husband is a seafarer? I heard a lot from my friends that having an aquarium at home with the profession of my husband is not god or brings bad luck.How true is this? This is not something that I know of. If their comments are really affecting you, I would suggest that you give your fishes away. hi.. i want to know that is it good to keep a betta for fish bowl aquarium in house? or can i put 2 goldfish (1 golden and 1 black one) or 1 goldfish with 1 redcap? Our aquarium is located in the center of the house separating the kitchen and living room. It is not right next to the fire elements like oven and stove. Is this okay? If not, what can I do/purchase to balance out? Moving the huge aquarium is impossible. The center of the house is more suitable for peace and lack of movement (that’s why it’s not suitable for stairs, etc). But since you can’t move this, perhaps only get smaller fishes so movement is not too big. There’s really nothing you can purchase to counter-balance movements. Thank you for responding, Victor! God Bless and more more luck come your way! Hello, I am wondering if keeping a saltwater tank is ok in vastu and feng-shui. Just checking before I set it up. Yes, a saltwater tank is totally fine. Your article is extraordinary, I have a 5 gallon fish tank with few mollies, few tiger fish, a pair of guppies, a pair of tank cleaners and i live in an apartment where my front door(entrance) is facing North, is it advisable keeping my fish tank facing in front of my apartment door that is fish tank facing North entrance door which is said to be my living room. right now its kept inside my bedroom area(i know its a wrong area as per Feng Shui). In the coming week, I’ll be publishing a post that’ll answer your question. Stay tuned! Hi , I am thinking of placing an aquarium in my house. It is of 22 inch in length. Is 6 fishes is the right number for the aquarium. As there is not enough space in my living room so I am thinking to place it in veranda opposite to entrance. And veranda is in the southeast direction of the house . Please tell me that the place and number of fishes are accurate. Hello Sir, Within this week i will be adding fish aquarium to my house which is of 3 feet length, 1 n half feet in breadth and height. Is it OK to install the fish aquarium in the North Direction. I am planning to keep 7 gold fish, 1 black moor and 1 Aarawana Fish will this help for my career and financial growth. Thanks in Advance. I have read your all post it is very helpful. I live a medium size room full with furniture with attached bathroom. Since I can’t put my fish bowl in my bedroom, I can put the bowl in bathroom? Also I have lots of houseplants in my room and I am thinking of shifting those to bathroom as well. Can I do that also? Please advise! As for plants, you can place them in the bathroom, assuming it has enough sunlight to keep it growing! Recently someone suggested me not to keep fish tank as it is not good to take away the natural habitat from fishes and closed them inside a aquarium. Its been almost 9 years now i am keeping this aquarium. But for last 1 and a half years my carrier is not good, i am even jobless since than. Simply moving removing or keeping the fish tank will have little effect on your career. A full Feng Shui audit will be required if you’re seeking help from Feng Shui. If you like the aquarium’s presence, keep it. If not, then remove it. Hello Sir is it ok to keep more then 1 aquarium in house I actually hav 2 aquarium in my house one is of my dad’s and other one is mine one is in hall in North direstion and other is also in North direction but in store room so tell me on this is it ok …. If your house is big enough, you can definitely keep 2 aquariums! I bought 1 aquarium on 6 june 2018 with 8 fishes 4 very small red 2 silver and 2 goldfishes. 2 fishes (small ones) died i don’t know how and why and my tank came up with a small hole so for 2 days they were in bucket but i was changing water and feeding them properly! They died in bucket! Now i am thinking that is it good to keep fishes in aquarium bcoz i think that they are in a trap! So please suggest me something to keep aquarium or not to keep it & where to keep and how! I have an aquarium which I used to have more than 15 fishes. But I have just not using the aquarium. No fishes and no water it is dry since a few years. My financial status which were good have declined. Is this anything I should worry about. But it is not a problem I am cleaning my tank now it is very huge can easily hold 30 fishes. I will reinstall the aquarium. I work from home. Please to your knowledge do you think me letting a huge fish tank try and dirty for years a bad idea ? Anything that’s dirty for years is bad hygiene. Also, your financial status can fluctuate depending on your home’s Feng Shui and your personal astrology chart (Bazi). A fish tank would not have such a strong impact when compared to your home’s Feng Shui and your Bazi. We have a house, front door is in North East direction. the door opens up right side, when we stand outside the house facing inside. The other side left of the door is free..can we keep the aquarium left side of the door, when we stand outside the house, facing inside the house..
Dear sir, Greetings. My fish tank rectangular in shape with flowing water filter type. It is kept on the left side of the front door. The front door faces east (when person is facing the door from inside) and the fish tank is beside it just to make the position clear to you. So it is basically in the north east corner of the living room. Is this a good position. Hello Victor my house is facing towards northeast so I bought acqurium I am planning to place exactly entrance of my front door I.e opposite to northeast that is south so shall I? How about placing an aquarium in Southwest corner of living room in from of main entrance door. Also suggest if Northeast corner would be a better idea..? You can definitely place it at your balcony, but I’d imagine keeping it clean would be difficult because of all the rain and dust. 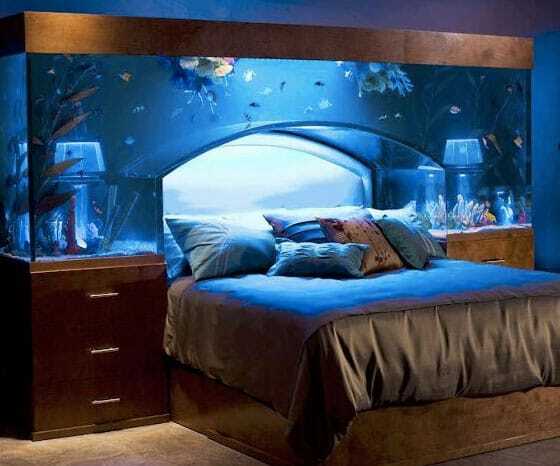 Try not to place the aquarium in your bedroom because it can affect your sleep. I have 4ft/1.5ft & D-1.5ft aquarium. What is the best and favourable quantity of fish I can keep the aquarium. Hi, i put 11 fishes in aquarium. Is that ok in terms of numbers? The aquarium should not be too close to the kitchen stove because of the heat. That’s because the temperature would affect the health of the fish. I’m sure you want them to live longer! We live in a split foyer house and our main door is facing EAST. I was just wondering where to put the aquarium. Our kitchen , dining area , and living room are located on the upper level. And one last thing, is it advisable to place the aquarium at the end of the hallway ( Southeast) ? Thank you!